Sunshine State? More like Carnage Capital. Florida is a perennial stand-out of the semi-annual report, which combines walking rates, pedestrian fatalities and other factors to measure risk across U.S. states and metros. This year Orlando was ranked the most dangerous, followed by Daytona, Palm Bay, Sarasota and Lakeland — all in Florida — rounding out the ignoble top five. Bakersfield (number 7) and Jackson, Miss., (number 10) were the only cities located outside the citrus state that managed to sneak into the top 10. 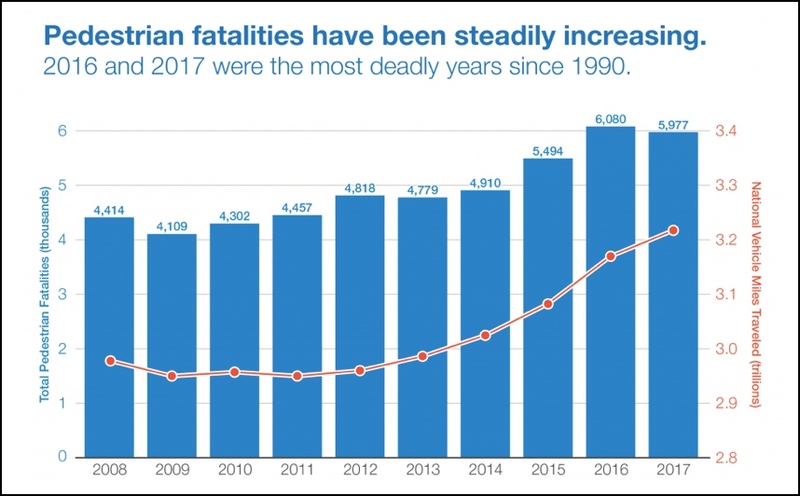 Over the last 10 years, pedestrian deaths climbed 35 percent in the U.S. A total of 49,340 people were killed between 2008 and 2017, or about 13 people every day for a decade. Pedestrian safety rates have been eroding compared to drivers and passengers. Pedestrians now make up about 16 percent of total traffic deaths. Since Smart Growth America last issued its Dangerous By Design report in 2016, 79 out of 100 metro areas got more dangerous for walkers. Pedestrian deaths are concentrated in Sun Belt States. The reason? “All of the Sun Belt states are challenged by separated land uses, pushing all the traffic onto our arterial road system,” Billy Hathaway, the transportation director for the city of Orlando, said in a press briefing on the report. In other words, communities in Florida and many Sun Belt areas have been designed in sprawling patterns, forcing most people to drive for almost every trip and resulting in a system based on wide, dangerous arterial roads. National geography is only part of the risk equation, however. People of color face disproportionate risk, with black people about 73 percent more likely to be killed while walking than whites. Native people are three times as likely. The federal government doesn’t track the income level of pedestrians who are killed, but crashes are twice as likely in low-income neighborhoods as they are overall. But the landscape is lacking, with incomplete sidewalks, wide roads and other risk factors. In wealthier areas, government agencies tend to respond to concerns about pedestrian safety by providing better infrastructure, Brown says. In other words, jaywalking tickets as opposed to crosswalks. The federal government needs to step up. The federal government and state transportation agencies are not treating the pedestrian safety crisis with the seriousness it deserves, according to Smart Growth America. Federal authorities should pass a “National Complete Streets Policy,” which would require state and local governments to ensure all non-rural streets have basic facilities for pedestrians, like sidewalks and crosswalks, the group recommends. Instead, engineers and bureaucrats continue to operate from an auto-era mindset that privileges vehicle speed over safety. For example, an important group of federal traffic engineers last week punted on requiring pedestrian signal heads — “Walk” signals — at every intersection, citing cost concerns. Less than 2 percent of federal surface transportation funding is reserved for bicycling and pedestrian projects, and that money even is increasingly under threat. State agencies with authority over streets still see pedestrian deaths as acceptable. Smart Growth America notes that 10 of the 20 states with the highest pedestrian fatality rates actually planned for more pedestrian deaths in 2018 than 2017 rather than work harder to bring the numbers down. Those states are: Alabama, Arkansas, California, Delaware, Florida, Kentucky, Michigan, Missouri, Nevada, and Oklahoma. The correct number of acceptable traffic deaths is zero, says Smart Growth America. I agree with Mr. Walker regarding police reports. As compared to aviation or maritime “crash” investigations and reports, police reports are not only useless, but actually prevent investigating and identifying corrective action. Yes, people disagree, but they don’t have to be disagreeable. What do I recommend? More local responsibility. More local involvement. How are YOUR roads engineered? How are YOUR drivers educated? How is YOUR jurisdiction enforced? Police reports, in my opinion, are designed to fix the blame and ignore the problem. If I may have and express an opinion. I suggest one common measure of effectiveness is the cost of crashes. What are YOUR vehicle insurance costs? Did you remember to consider external costs? Again, one must take into account the attitudes of people in cars. In the south this can only be considered a move to democide. People are also much lighter than cars, so they will inevitably lose in a collision. And people aren’t protected by a metal shell. This puts the onus squarely on motorists to avoid hitting pedestrians, since motorists can cause much the greater injury to others. 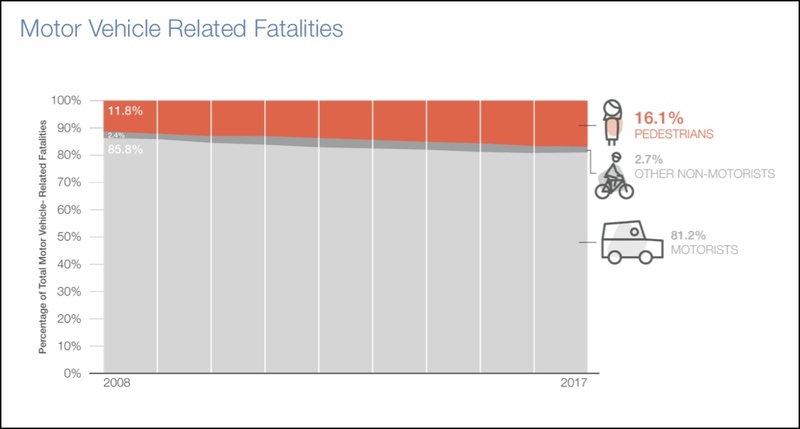 These deaths are clearly caused by pedestrians not knowing their place and thinking they can walk in public places, sometimes in dark colored clothing, without being in the way of safe motorists who are just trying to go about their business.